I have once again been away doing a little fishing. 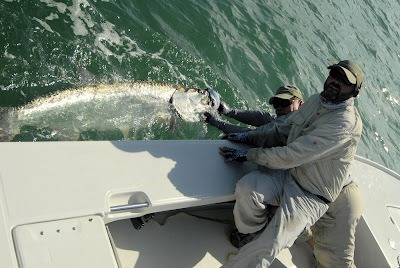 This time it is to Florida for a few days of tarpon fishing. 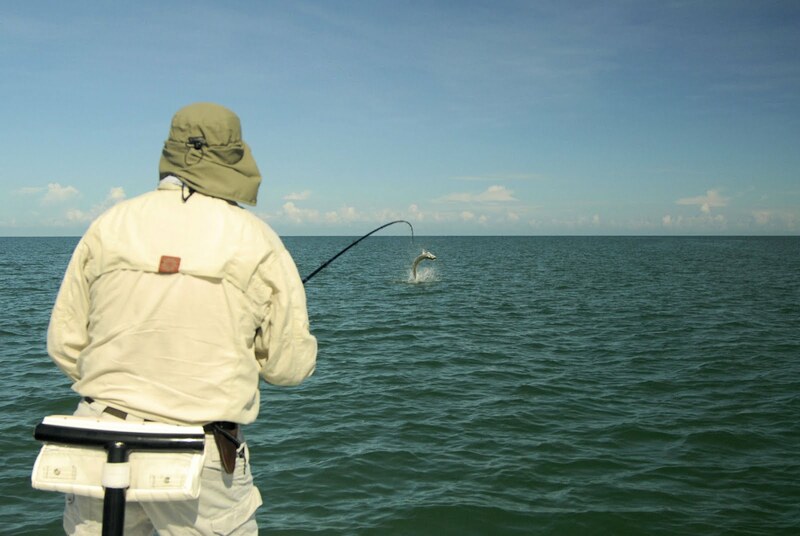 There is nothing easy about fishing for tarpon. However I did manage to bring one to the boat. The measurements on the fish are 64 inches in length with a 34 1/2 inch girth. This gives the tarpon an estimated weight of 110 pounds. It took me 30 min. of intense pulling with a 9 foot 12 weight Rod to bring the fish to the boat. I have yet to figure out how to describe how hard I was pulling on this fish. Other than saying that I was: pulling on this fish like a pissed off farm boy: polling on old cow. I also posted a few other photographs besides the tarpon. A nice sea trout and a lady fish both a lot of fun to catch. The local trout fishing, I have not been on our local waters over the past week. What I can tell you is we need rain. This is no news to anybody. Water flows are terribly low as result that trout are extremely spooky. Your best fishing is going to be first thing in the morning. Because of the low water flows once the sun gets on the water the trout will head for cover. Here are a couple tips to help you deal with these conditions. The first may seem pretty obvious, but a lot of people seem to neglect these steps. Dress in earth tone colors, so you blend into the background vegetation. Another thing to keep in mind is to keep you waiting to minimal, when you do wade, trend extremely softly. Keep in mind we have been picking on these fish since April. They know the game. One trick I use when fishing The Trico hatch, is to learn where the various pods of trout are feeding. Once I do this I will set up in these locations before the Trico spinners fall on the water and the trout start to feed. If you are there before the fish move in, they will think you are part of the pool. It is still important to keep your movement to a minimum though. The prolonged dry weather and hot summer heat, has not helping the trout fishing. All of our trout streams are dreadfully low. We need to use extreme care in both our approach to fishing the creeks and how we handle the fish. Keep in mind not only is the water low but temperatures are warm. It is easy to stress the fish. On a brighter note to form for this season, two weeks ahead of schedule and we got Trico’s. This is a size 20 black-and-white mayfly. These mayflies are an early morning hatch, so early in the morning, that some mornings it still dark when the bugs come off. We take advantage of this hatch, when the mayflies are coming back as spinners. The spinner fall also happens first thing in the morning. Plan on being on the water around 6:30 am and fish until mid-morning. It is still early in the Trico hatch. Expect the bug activity and the fish feeding activity to be spotty for another week. Once the bugs and the fish get going this can be an excellent hatch for the dry fly fisherman. Along with the Trico hatch it is also aunt and beetle time. Even though it may not see a lot of these bugs on the water, they are constantly falling into the creeks and being available for the trout to feed on. Nothing else is going on fish and ants and beetles can be a great option. For the ants, keep these flies in the size 20 to a size 16, for the Beatles size 16 and 14 are a good choice. Note I am still offering my summer hatch special. Now it will be fishing the morning Trico hatch. If interested call for details on cell number is 585-233-0436. Also it is getting time to start thinking about your fall fishing trips. Make sure you get the prime dates that you want for this fall.